After a brief jaunt in the Midwest, I'm back to Denver, and back to summer. I love pulling out those pieces that don't quite work for fall for one last wear before the temperatures drop. This playsuit is definitely one of them. Bonus points for its pajama-like qualities. 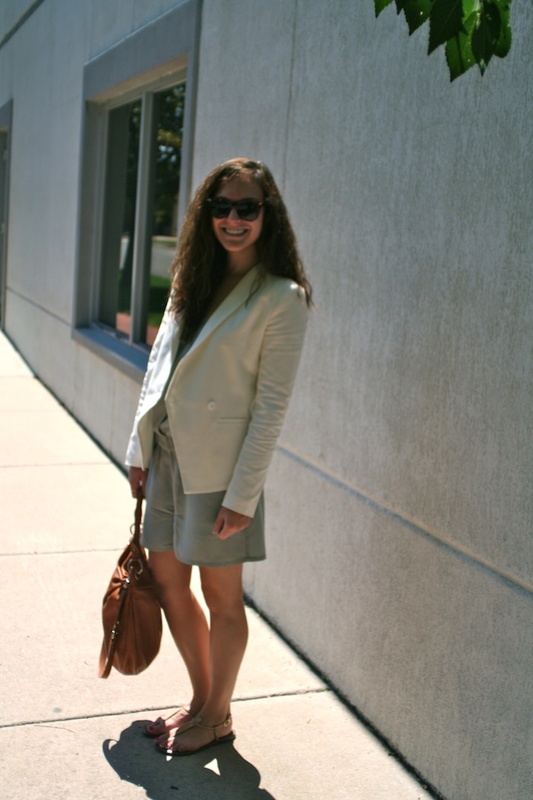 Romper by Hinge, Truth and Pride blazer (romper & blazer both from Nordstrom), Urban Outfitters sunglasses, Marc by Marc Jacobs bag, and Sam Edelman's Gigi sandals. Thank you! I know, it's so perfect for summer. Soooooo cute!!! I just love your blog so much!!!! Thank you! Following you now :) Can't wait to see more of your posts, either! very nice look!! like your jumpsuit and shoes!